This chart shows historical P/E Ratios for the S&P 500. Over the last 20 years the S&P 500 has tended to bottom at a rolling P/E Ratio of 15. This offers a clear picture of where valuations stand today. A bottoming formation in the US 10 yr. Government Bond is following prior patterns seen both in the U.S. and Japan following past crises. Two Hundred and Fifty years of interest rate data confirms this theory, as bottoms usually take years to form versus tops that are sharp in nature when they peak. Current Taylor Rule indicates that rates should be 2.93%. Long term Real Rates of Return (10yr. Treasury Bond - Inflation) have been generally declining for 39 years. Currently the United States Real Rate of Return is .91%. Globally that number is -.27%. A positive year for 2018. $11 trillion in assets need to be sold compared with approximately $876 billion in equity that needs to be added to the list of 29 G-SIBI’s. This is a reduction of $76 billion from a year ago. For another year in a row, France and Japan will need to make the most headway in adding capital to their banks in the years to come. 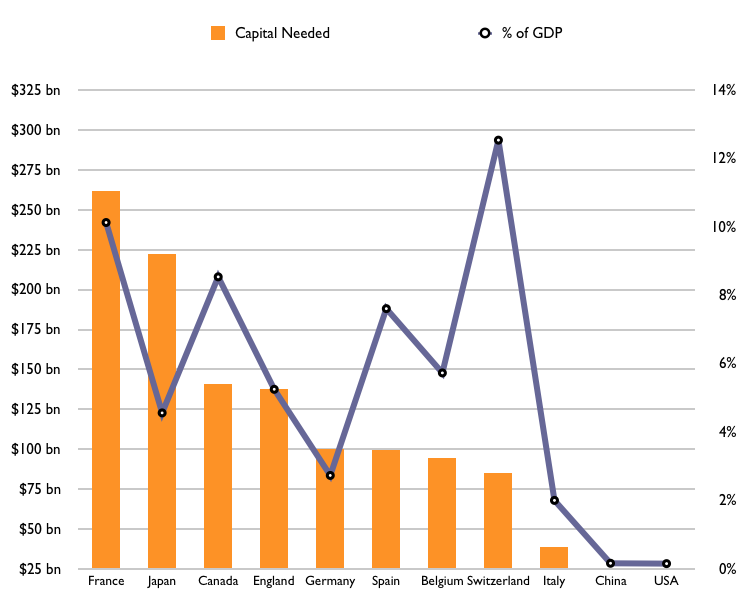 France, Japan, Canada, Spain, and Switzerland have the most to consider in how they raise capital in relation to their economic footprint. Expect to see equity to increase on company balance sheets during 2019-2021. This chart is one of the best indicators of where valuations in the equity market present themselves. Central Bank money printing (currently spearheaded by the ECB) is having a dramatic cause and effect relationship with all global asset classes. Shaw Group expects another $1 trillion will be printed in the next 4 years. This could increase total market of all assets by ~4%. The chart below hit a high of 1.512% in 2000. The current indicator stands at 1.359%. Two Hundred and Forty-Four years of data show that historic inflation averages 1.65%. 30 year cycles appear present. This would indicate that the bottom of our declining rate of inflation will not subside until 2018. 2025 is when estimated inflation trends cross and would thus imply a structural change in trend. The views expressed here represent the opinion of Shaw Group, LLC. and are not intended to predict or depict performance of any investment. Material discussed herein is meant for general illustration and/or informational purposes only and should not be used or construed as investment advice or an offer to buy or any endorsement, recommendation or sponsorship of any company or security by Shaw Group, LLC. Although the information has been gathered from sources believed to be reliable, please note that individual situations can vary. Shaw Group, LLC. does not guarantee the suitability or potential value of any particular investment or information source. Therefore, the information should be relied upon only when coordinated with individual professional advice. With any investment vehicle, past performance is not a guarantee of future results. No information should be interpreted to state or imply that past results are an indication of future performance. Investors should be aware that there are risks inherent in all investments such as fluctuations in and potential loss of investment principal. Investors need to be aware that no investment plan or asset allocation can completely eliminate the risk of fluctuating prices and uncertain returns. You acknowledge that any requests for information are unsolicited and shall neither constitute nor be construed as investment advice by Shaw Group, LLC. to you. Shaw Group, LLC. may invest or otherwise hold an interest in companies or securities discussed on shawadvisors.com. We share our insight regarding global capital markets and investment themes via proprietary analysis.